Spotted this beauty on NASA's Astronomy Picture of the Day website. 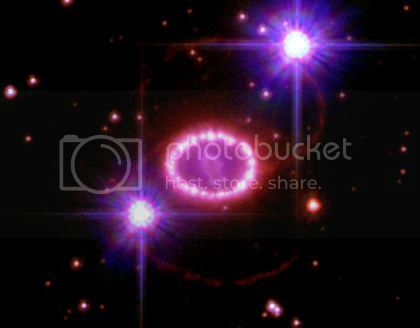 The ring in the center is Supernova 1987A which, as you may have guessed, is a supernova witnessed by astronomers in the year 1987. There are numerous theories for why it appears this way with two hoops surrounding it, but "their origin is still largely unknown." Supernova 1987A remains one of the brightest stellar explosions we've witnessed since the birth of the telescope 400 years ago. These gigantic explosions occur as the final event in a massive (larger than our dwarf Sun) star's life. For an unfathomable length of time, a massive star maintains a delicate equilibrium between the strength of its outward-pushing nuclear explosions and inward-pulling gravitational force. At the end of its life, a star stops producing the nuclear energy at its core and the entire thing compresses in on itself through the violent process of gravitational collapse. As all of the matter and energy collapses into a tiny dense sphere, it suddenly bounces back outward and creates an incredibly luminous explosion. They are often so powerful as to outshine an entire galaxy (which is approximately 100 billion times larger). I don't quite understand this stuff thoroughly enough to explain much more than that but I do want to mention neutron stars which are one possible final scenario after a supernova event. A neutron star is an extremely condensed little star that, as its Wikipedia page attests to, squeezes 500,000 times the mass of the earth into a sphere smaller than Manhattan. These sci-fi-sounding spheres are scattered throughout the universe. For more incredible astronomical stuff to look at and ponder, go check out THIS page with a time-lapse image of Supernova 1987A's shockwaves smashing into surrounding debris. It's really interesting that we aren't continually lost in wonderment at the scale of the place we inhabit. For a somewhat more planetary light show, I recommend my fellow Finneganian's blog post on her recent sighting of the Aurora Borealis. I fantasize about a future where every intelligent human being on the planet has an accurate understanding and perspective of our tiny planet amid the vast infinitudes of the cosmos and what advancements and quantum leaps in cosmological understanding this may bring. Basic knowledge of astronomy and modern physics spread out among the whole human population could really push our species forward a step. I think it will happen. It must have been so hard to make the leap from the earth-centric view of the universe, but nevertheless it happened. I really want to extend my understanding in both these areas. It is slow to happen, though.